There are a number of endemic racers found in Galapagos, one of which is unique in that it has learnt to hunt marine fish. Racer snakes on Galapagos are constrictors and only mildly venemous. They are known to prey on lava lizards, geckos, insects, iguanas, mice, rats and hatchlings of several bird species. They are not at all aggressive towards humans and could not do much harm if they were to attack after being threatened. Racers tend to be dark brown with stripes or spots. 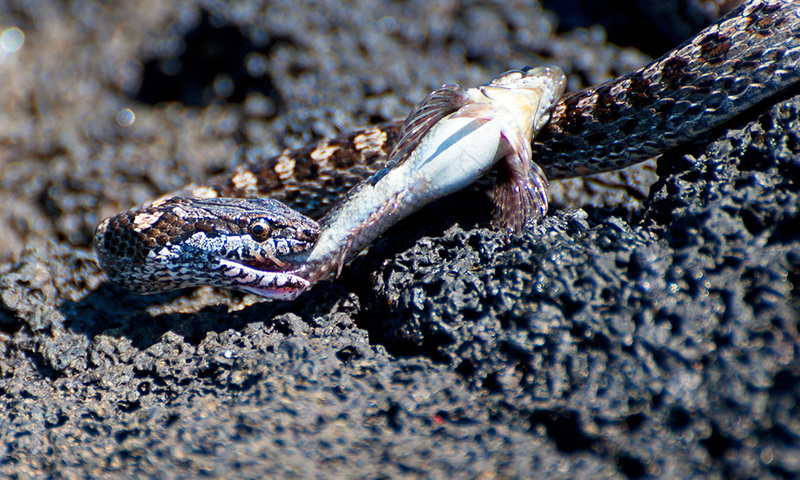 There is some confusion over the number of species of racer snake found in Galapagos due to poor research. 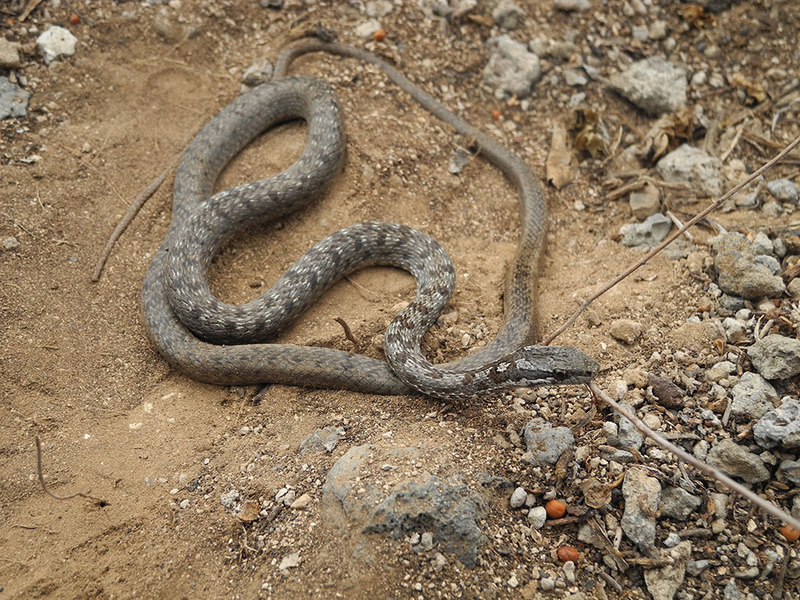 The latest research suggests that there are: the Galapagos racer (Pseudalsophis biserialis) from San Cristobal and Floreana – though it is locally extinct on Floreana and now only found on nearby islets; the Espanola racer (Pseudalsophis hoodensis) from Espanola and adjacent islets; Santa Cruz racer (Pseudalsophis dorsalis) from Santa Cruz, Baltra, Santa Fe and adjacent islets; Fernandina racer (Pseudalsophis occidentalis) from Fernandina, Isabela, and Tortuga; banded racer (Pseudalsophis slevini) from Pinzon; and the striped racer (Pseudalsophis steindachneri) from Baltra and Santa Cruz. It is the Fernandina racer which has been observed hunting for marine fish from rock pools and the shallows around Fernandina. GCT Ambassador Godfrey Merlen was the first scientist to ever see this behaviour happening as he noted up to 15 individual snakes slithering around the lava rock pools around Cape Douglas. 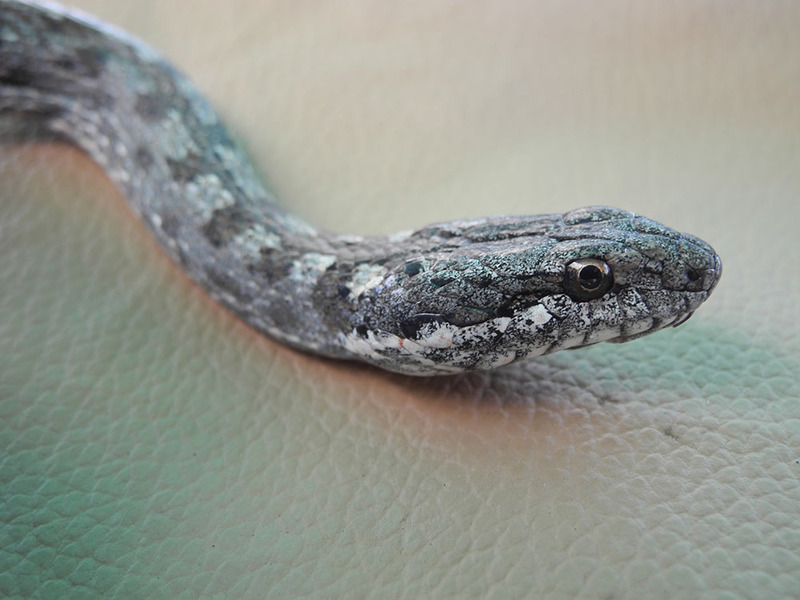 This is a unique behaviour of terrestrial snake not observed anywhere else in the world. The racers on Fernandina were also the stars of BBC’s Planet Earth II where they were filmed hunting juvenile marine iguanas. Where to see them: Racer snakes can be found on most of the major islands, though they are now locally extinct on Floreana. When to see them: The snakes are found throughout the year, but unlike many other Galapagos animals they are shy of humans and will hide away making them reasonably tough to spot without looking for them specifically. They are diurnal, most active around dawn and dusk, and often rest around midday. Threats: The native snake population has been decimated by introduced species such as cats, pigs and feral goats which forage for their eggs. Conservation actions: There is research into the Galapagos racer on the islets off Floreana island, looking at their demography and conservation. They are a priority species for reintroduction to Floreana island from which they are locally extinct– we are working partners to restore the habitat on Floreana to enable this to happen. 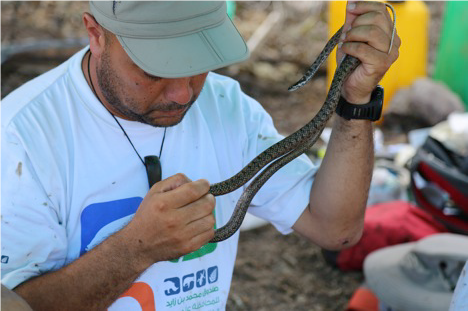 Please help us to protect the Galapagos racer by donating to our Restoring Floreana programme today. The famous scene from BBC Planet Earth II which was filmed on Fernandina.